Clearly, I have failed miserably at the month-long-five-day-a-week posting challenge that I embarked upon at the beginning of April. I'm not sure how many times I've actually posted, but I'm quite sure that I haven't kept up my end of the deal. Sigh. But I tried. And I did write more frequently than I did in March. Which isn't saying much. But still. I wrote. Life has been a whirlwind over the past few weeks. In retrospect, April probably wasn't the best month to begin a writing challenge, since we've been to both Starkville and Franklin, and we have even more weekend trips on the books. Busy time. But good. I love spring. And baseball season. And sitting in Section M at Polk Dement Stadium at Dudy Noble Field. I'll be honest. I don't really watch that much of the game while we're there. 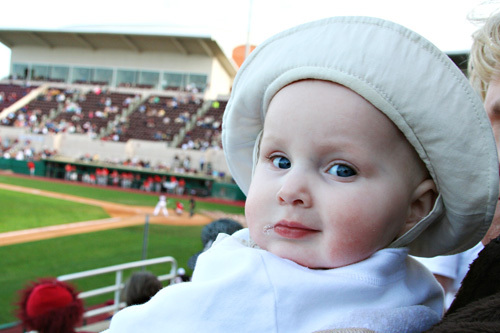 But I do so enjoy spending time with family, eating boiled peanuts, people-watching, and cheering for the bulldogs. Micah likes it so much she drools over it. I love Starkville in general. It's got Little Dooey's and Abner's and Bulldog Deli. Yum. I miss all those restaurants. College days were good. Mississippi State holds lots of memories. It's where I met my husband. Where I made lifelong friends. Where I learned about life and love and faith and God. But I also like coming home. There's no place like home, you know. That's enough rambling for now. I need to wake the little lady up so she can hang out with her Nana, Grampa, Aunt Stacy & Uncle Phillip. They'll be here soon.